You are searching for a well structured table tennis shop because you like playing table tennis in your free time, or because you play table tennis in a club and want to become better also searching for new material? You are thinking about what might be the most suitable table tennis racket for you? You need advice? Or you already know things and just want to browse a bit? 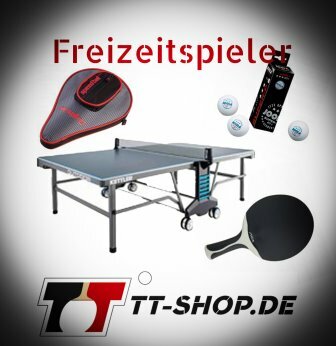 No matter what needs there are regarding table tennis, this table tennis online shop is definitely the right choice for you! Do you have a question or do you need an individual offer? Here you can find any type of table tennis equipment. Beginning from finally assembled bats and a huge selection of balls, up to separately available table tennis blades and corresponding rubbers. In order to organize the quite long text from our starting page, we compiled an outline. With this it is easier for you to understand the structure of this table tennis shop. However, this text also is made to get to know me - Matthias Bormann from Germany, the CEO and co-founder of this shop. In this shop you´ll find everything you need!! In this table tennis shop you´ll find everyhting you need! Considering that there are more than 50 table tennis brands which annually bring blades and rubbers on the market, the offer has reached astronomic proportions! Respect to players, who still keep the overview. The daily work with this table tennis shop is to do exactly this job for you! We offer an excellent guidance and advice regarding all brands, which we thoroughly choose and compile at TT-SHOP.COM. The most popular and common products are table tennis blades and rubbers. Those exhibit many different technical properties, which have to be adapted and fitted to your own gaming system. Based on this, one chooses the equipment and products. Hence, table tennis brands commonly provide information regarding speed, control, and/or spin. This facilitates an orientation in the depths of the material-jungle. Of course, we don´t want to deprive such information. for each TT rubber and TT blade you´ll find a clear table, sorted according to the brands in the side menu. Type of Handle: commonly straight, flared (mostly used), or anatomical. FREE mounting of the rubbers (red for forehand, black for backhand, or vice versa). Sealing of the blade: Highly recommended in order to avoid damages to the veneers when replacing the rubbers. The table tennis racket, consisting of two seperately available rubbers and a blade, is a central sports equipment and can make the difference between victory and defeat. Hence, its quality is a major criterium. 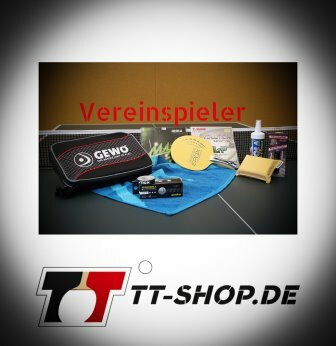 This table tennis shop focusses on the above mentioned products. We are looking forward to provide you with advice on your next shopping trip at TT-SHOP.COM. This question seems to be an easy one: A bat, a ball, at least 2 players, a table, and a net! Unfortunately, this is not all. Otherwise, we wouldn´t have created TT-SHOP.COM! Only considering the recreational sector, we offer approx. 40 different rackets in our product range. This number is a result from carefully limiting and reasonably categorizing products. Take a look at our recommendations, and you´ll see what we are talking about! Most players compile their bat by their own. They seperately buy the rubbers and blades. The reason for this is because every player has his/her own gaming style. We included this into our web appearance and offer a first classification into: Offensive speed (Off+/Off), offensive spin (Off-/All+), allround (All), and defensive (Def). Also, this classiciaction is not present elsewhere in such a detailled and extensive way. Of course, this classification can only be considered as a guideline, because every player is individual, with varying basics and different needs with respect to the bat he or she needs. Without table tennis balls there is no game, thats´s for sure. We offer training balls, but also balls for competitions. The introduction / use of the new plastic balls is highly anticipated! Right now, these are only obligatory in higher leagues. Obviously - the table is also essential to play table tennis. When searching for a table, especially hobby and recreational players are recommended to consider our advice and range of products. Nowadays, there are really good and high-quality tables for an indoor and outdoor use (weatherproof!). Regarding tables, one should first find professional advice to avoid buying a pig in a poke. Good advice is, as already mentioned, also very important when buying rackets. Especially regarding table tennis bats, advice is really important! How does my gaming strength fit in? What am I capable of, and what are my goals for the future? The higher the level of playing, the more pressure is necessary to score (harder and faster material should be chosen). The lower the level of playing, the more control is neccesary (slower and softer materials should be chosen). Is there not yet the right for you in our shop? No problem! 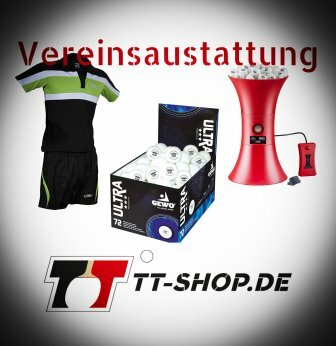 If you still didn´t find the products you are searching, please write an email to: "info@tt-shop.com". We are directly working together with the different table tennis brands and are an independent table tennis shop. Hence, we can order (almost) EVERYTHING for you! Our slogan is: Playing a better table tennis! In this sense, we try our best for you and your success! The focus of this shop lies in a comprehensive, but also well-structured offer regarding bats, which are available at fair (and often additionally reduced) prices. The saying "To be spoilt for choice" is particularly true when choosing a table tennis racket. Finding the perfectly fitting equipment often takes a long time This is very true for club players, who often consider changes of material. Or, for players who realize after half a year (or later) of intense training and competitions: Well, my bat is worn-out, I need something new! In addition to this scenario, there are also players who want to find the best possible bat for their highly individual goals. Shop for table tennis bats - Complete bats, bats from big stores, or maybe professional bats? As mentioned above, when searching a bat, one is spoilt for choice regarding brands, types (allround, offensive, or defensive), and so on. Please note that bats are also divided into other categories. These are where they come from and how were they processed. Do they come from big stores? Are they complete bats (finally assembled and ready to be used) coming from a table tennis store, or are they professional TT bats? Each type exhibits certain pros and cons which we want to show you in this article. For all types of table tennis bats, the following applies: Thebat consists of a blade and 2 rubbers which are glued on the blade from both sides. If the rubbers are not included, it is not a bat or racket, but a blade. Most big stores or sports shops have different sections. The table tennis section is similar to a common table tennis shop. In general, those big stores are not specialized or limited to table tennis. The bats avaiable there are beginning at approx. 8 Euro (so called "run-of-the-mill bats, with very thin rubbers, pimples out). But there are also bats more expensive, e.g. for 60 Euro. Especially the cheap bats, but also the bats which are more expensive (!! ), are totally fine for occaional hobby and recreational activities, for patients in rehab centers or hospitals, for kids when celebrating a birthday with friends, and so forth. If, however, you play table tennis more often, if you are planning on becoming a memer in a table tennis club, or if you are a member already with a relationship to this sport, ambition, and fun, then the situation is quite different. In such and similar cases, complete bats from those big stores are not recommended. They have, however, their place in the community and we would be a bad example when not offering them. Bats from big stores also have their advantages, and are totally fine for the large amount of hobby, just-for-fun-players. This is still true even though well-known and established brands, such Butterfly, Donic, or Schilkroet, offer big store bats. They can be recognized by their transparent plastic wrapping, whilst the rubbers are already mounted (a so called complete bat, finally assembled for instantaneous use). The rubbers are commonly of low quality, and their catchyness quickly reduces over time. Often, these rubbers canot be reordered. The blades tend to warp over time and are, hence, also of low quality. By the way: This is also true even if there is an ITTF logo. ITTF corresponds to the International Table Tennis Federation, and if this logo is present, one is allowed to take part in official competitions. In this TT shop you will find all types of rackets you need. Especially, when you are searching for an entry-level bat, or when you are searching for a larger amount of bats for schools or other institutions. For these purposes, we recommend the following categories: Table tennis bats for hobby and recreation Here, you can not only find inexpensive bats of each price-level. Starting form 7.50 Euro, up to the first allround bats for the transition between hobby and club activities: You´ll find reduced special offers ranging from 7.50 to approx. 60 Euro. Depending on your desires, you can simply choose the best possible bat for hobby activities. Paricularly beginners cannot always differentiate between complete bats coming from a big store or from a specialized dealer. This becomes evident only when having a closer look at the blade, rubbers, and gluing. When buying your bat from a specialist, this is done by a pro, and not by any worker at assembly lines or by a machine. Rubbers that are coming from a table tennis specialist (of course also available separately) are superior regarding their quality, and exhibit a longer durability compared to the ones coming from big stores. Furthermore, they exhibit various specifications which are very important when choosing a rubber: Amount of spin, speed, control, and so on. These specifications are often lacking considering bats from normal stores. Although of superior quality, of course high-end rubbers also have their limits, wear out, and do not last forever. To increase their durability, one should care and maintain them (e.g. by protective foils, spray, etc.). Important hint: The price of the rubbers does not correlate to their durability! In other words, expensive rubbers do not neccessarily last longer! Tibhar Robo Pro Junior - Small but fine! Tibhar Aurus Soft Table Tennis Rubber - Our recommendation for the controlled offensive! Xiom Vega Europe DF - More feeling, softer, AND faster! Donic Desto F3 table tennis rubber - Allround Plus! Donic Desto F2 Table Tennis Rubber - Speed and Control for a Controlled Offensive! Tibhar Robo Pro Master - Pure quality! Tibhar Evolution FX S - Soft sponge, catchy topsheet! Tibhar Aurus table tennis rubber - For an offensive style!